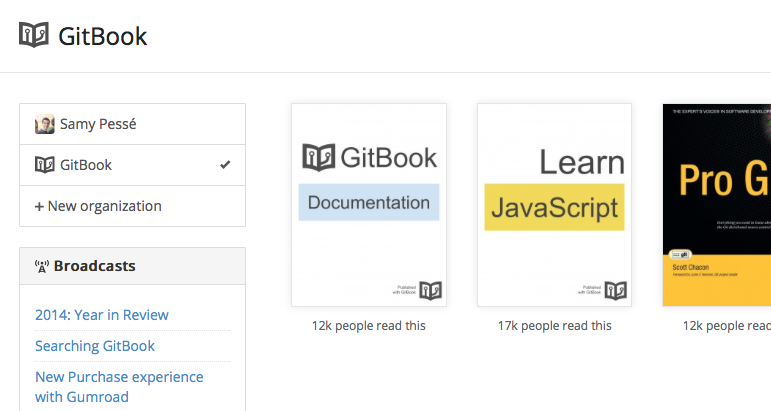 Many authors use GitBook as part of a team (company/university/…) collaboratively authoring books or documentation together. A highly requested feature was to be able structure those teams inside GitBook, this is now possible ! If you’ve ever had to manage multiple GitBook accounts, desired a team-specific dashboard or needed to share multiple books with your team, you’re going to love Organizations. Creating an organization helps you centralize your organization’s books. All books live under the organization, collaborators are managed in a single place and billing goes through a central organization account. Any owner of an organization may edit that organization’s settings, from profile details to billing information. Quite a few of you had been asking for this feature for a while and had been using workarounds, such as creating a seperate account for the organization, so with that in mind not only is it easy to create new organizations, but you can easily convert old (user) accounts to an organization ! Go ahead and create a new organization to bring your team together on GitBook ! We hope you’ll enjoy this feature and that it will boost you and your colleagues productivity. As usual if you have any feedback or ideas you would like to share, we would love to hear them ! You can reach us through our contact form or by email.